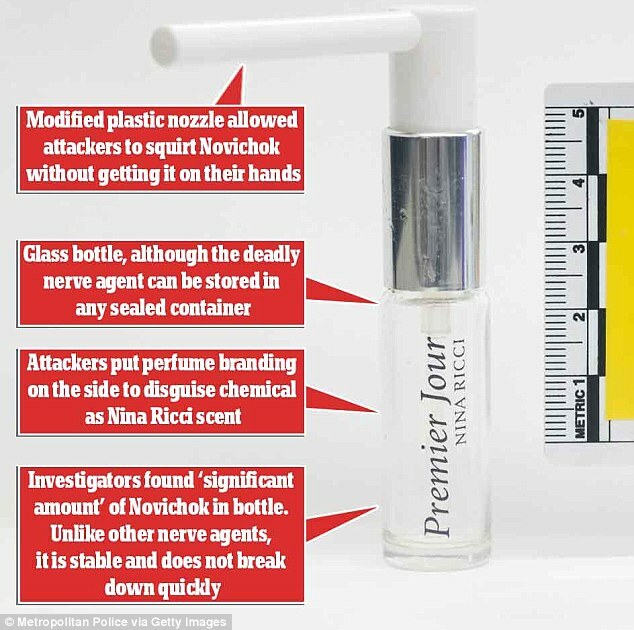 The Russians spent a fortune on the tiny James Bond-inspired perfume bottle used to carry novichok including developing new technology to ensure it wasn't a suicide mission for their agents, experts revealed today. 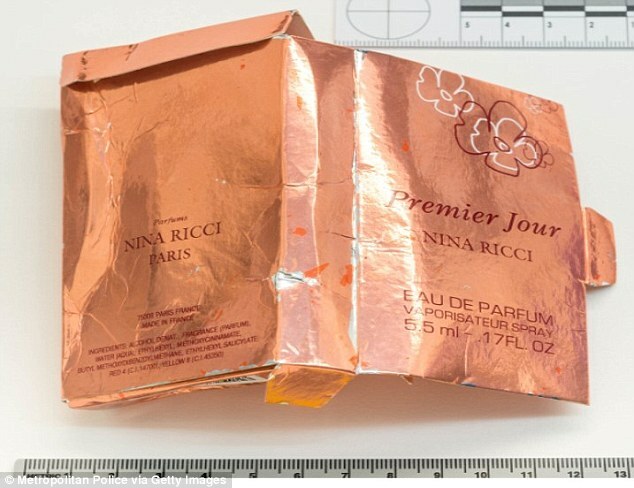 Hamish de Bretton-Gordon, one of Britain's top chemical weapons experts, says the fake sample vial of Nina Ricci Premier Jour could only have been produced by Putin's top scientists in their most sophisticated and top secret lab. He told MailOnline: 'They needed to ensure that the men carrying out the attack did not kill themselves while doing it. It would be deeply embarrassing if their agents died on foreign soil'. 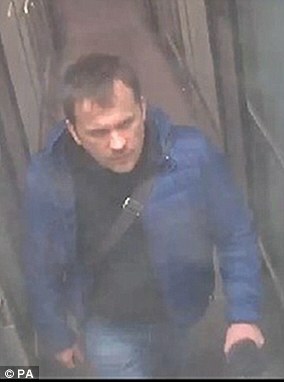 The two assassins, using the aliases Ruslan Boshirov and Alexander Petrov, carried the bottle of Novichok into the UK unhindered before spraying it on Sergei Skripal's front door in suburban Salisbury in March. Experts believe the botched hit came after up to three months of development and testing probably sanctioned at the highest levels of the Russian state. The lab, branded 'Q-ski' after the research and development division of the British Secret Service in James Bond, made the bottle and 'one-way' applicator nozzle so it was impossible for novichok to leak out in transit. It was also made of special toughened glass, plastic or ceramic sure not to smash, crack or degrade while carrying one of the world deadliest weapons. Mr de Bretton-Gordon told MailOnline said the 'sophisticated' perfume bottle would have cost thousands to build from scratch and required top scientists to achieve. He said: 'The technology in the bottle was very sophisticated and no doubt took a great deal of expertise to produce. 'It was probably made out of special toughened glass, ceramics or plastics which would not leak this deadly agent in transit and would allow safe application onto the Skripol door handle for the attackers'. He added: 'It would have taken very careful development and testing. No doubt they did dummy runs with it through airports to test the concept and possibly tested in labs with real nerve agent. 'They probably did not go through airport security at Moscow, but would need to have taken into account a plane divert where they would have to go through a scanner'. The weapon was disguised as a 5.5ml sample bottle of the Nina Ricci Premier Jour perfume. The counterfeit bottle was packaged in a glossy custom-designed cardboard box, based almost entirely on authentic branded goods. The discovery of a lethal chemical weapon disguised as a perfume bottle sealed the case against Russia. 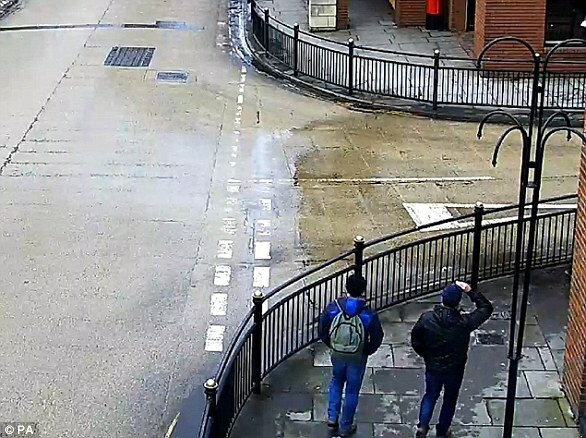 Investigators suggested the nozzle could only be fitted at the point of the attack on the Skripals’ home. It would have then delivered a tiny amount of the deadly chemical, which had the consistency of a gel, via a long tube to keep it away from the hands of the user. Scotland Yard do not know what happened to the bottle between the attack on March 4 and its discovery on June 27. Charlie Rowley, 48, found the package in a charity bin behind a branch of Barnardo’s in the city centre. Three days later, as he tried to reassemble it, his girlfriend Dawn Sturgess, 44, made the fatal decision to smear its contents on her wrist. One source close to the inquiry said: ‘Experts discovered a great deal of time, effort and expense went into making this object and executing this specific task. 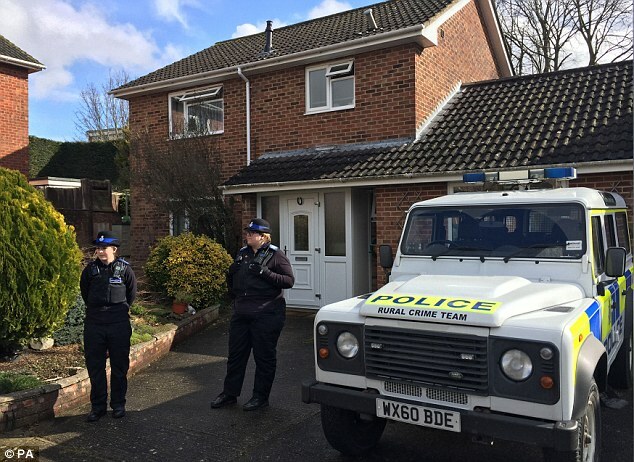 Yesterday, police confirmed that despite extensive searches items contaminated with novichok may remain in Salisbury. They also cannot be certain that the bottle and applicator is the only one used in the attack on the Skripal home. Counter terrorism Assistant Commissioner Neil Basu said the manner in which the bottle and packaging was counterfeited made it a ‘perfect cover’. 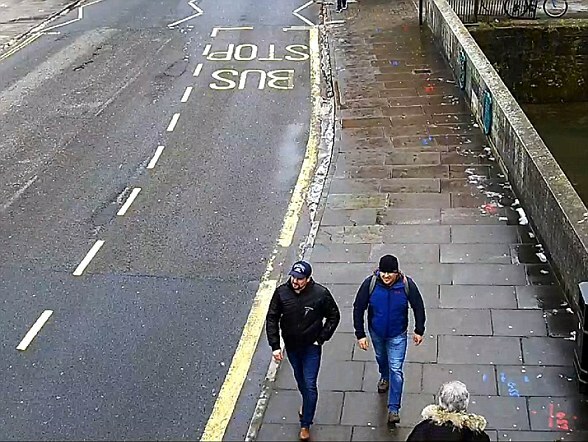 Scotland Yard today released detailed information about the movements of the prime suspects in the novichok nerve agent attack. 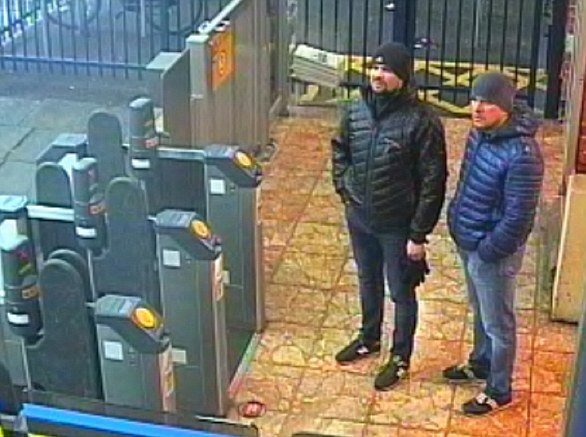 Alexander Petrov and Ruslan Boshirov arrived in the UK on a Friday afternoon in March and checked into a budget hotel in east London. 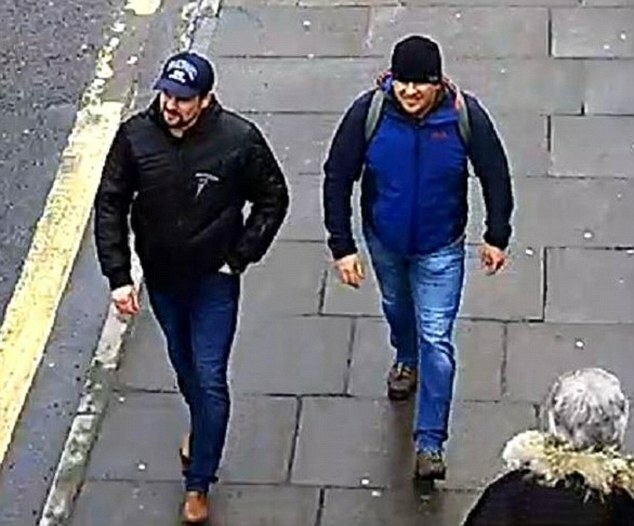 On the Saturday, the day before the attack, they carried out a reconnaissance trip to Salisbury before returning to London. 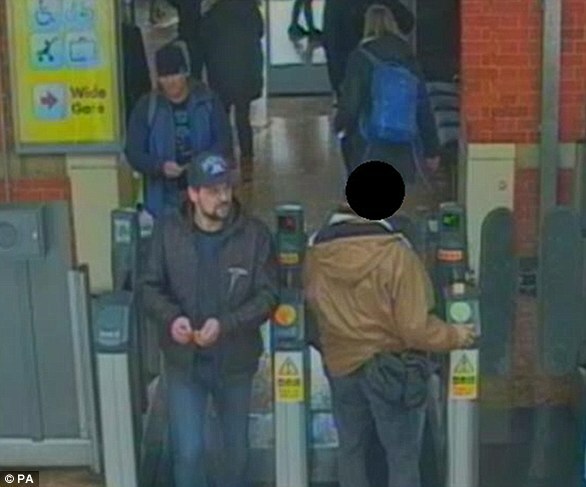 On the Sunday, they took another train to Salisbury and are thought to have smeared the novichok on Mr Skripal's front door. That afternoon they returned to London and flew from Heathrow hours after the Skripals were found collapsed in a park. 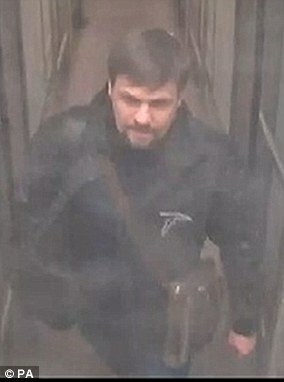 Friday, 2 March: 3pm: The suspects arrive at Gatwick airport, having flown from Moscow on Aeroflot flight SU2588. Friday, March 2 5.40pm: After travelling into London by train, the pair arrive at Victoria station. 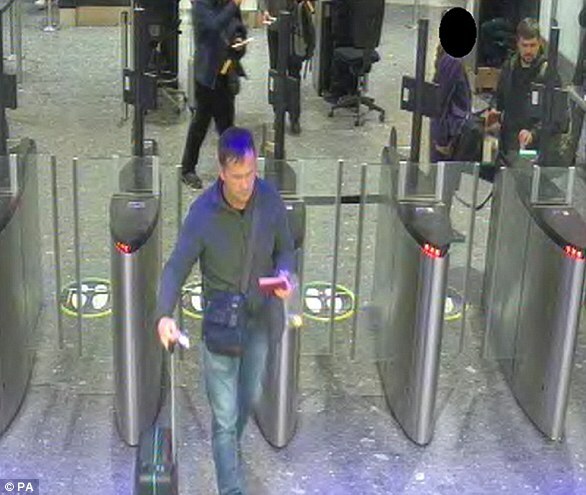 6pm: They travelled to Waterloo station, where they were seen between 6pm and 7pm. 7pm: The pair then travelled to the City Stay Hotel in Bow Road, East London, where they stayed on the night of the Friday, 2 March. Saturday, 3 March: 11am: They left the hotel and took the underground to Waterloo station, arriving at approximately 11.45am. 2.25pm: Having caught a train to Salisbury from Waterloo, they arrive in the cathedral city, the day before the attack. 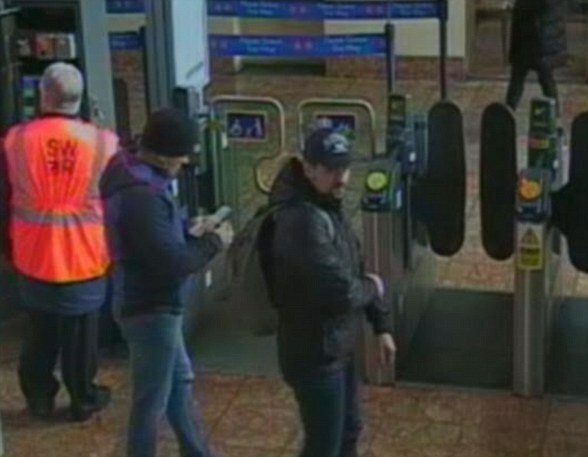 4.10pm: After carrying out what police believe was reconnaissance of the Salisbury area, they leave the city and return to London. 8.05pm: They return to their hotel in Bow and stay there for the night. Sunday, 4 March: 8am: They made the same journey from the hotel, again using the underground from Bow to Waterloo station before continuing their journey by train to Salisbury. 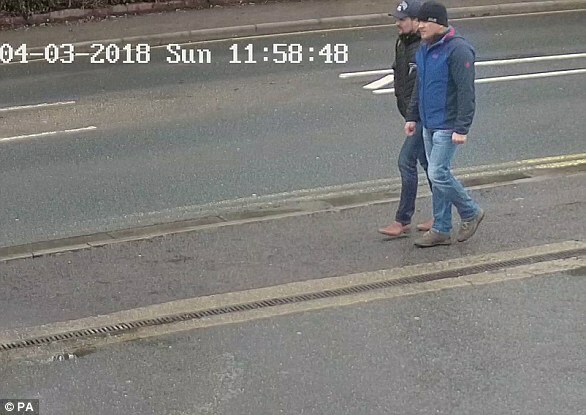 CCTV later showed them in the vicinity of Mr Skripal's house and police believe that they contaminated the front door with novichok. 4.45pm: The arrived at back Waterloo Station after the hour and half journey from Salisbury. 6.30pm: They boarded the London Underground to London Heathrow Airport. 10:30pm: They fly out of London, returning to Moscow on Aeroflot flight SU2585.